My garden is my test ground. Most of what I know I learned by screwing up at least once. So here’s some tips I’ve learned through trial and error. Typically I’ve combined plants that I have rather than plants that I’ve designed to go together. 2. Where do you expect your container to live? Full sun or full shade or a combination? We usually think we’ll need lots of sun to get the colourful container garden we want, but in fact there are LOTS of colourful shade loving plants. 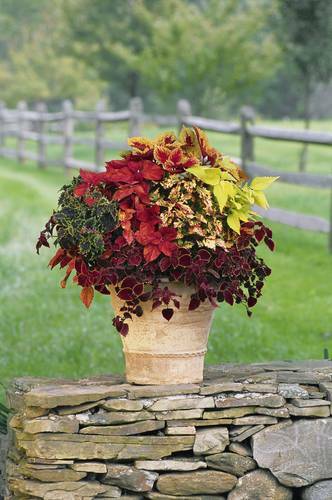 My favourite would be coleus, with it’s stunningly coloured foliage and completely insignificant flowers. If you don’t have full sun, how many hours of sun do you get? Or if no direct sun, how deep is your shade? Only morning sun, or shade from trees that are high overhead, might be called light shade, or dappled or bright shade. But shade that is on the north side of a tall building with another building close by would be dense shade. 3. Is it going into a small space or a big space? Small spaces don’t necessarily need small containers, in fact sometimes just the opposite. A small balcony can be visually enlarged by filling one end with a large extravagant container garden. 4. How big an object do you want? Do you want one big pot or a bunch of coordinating small pots? The larger the container, the better it tolerates hot dry days, and the more nutrition it holds. But more smaller pots may give you more “terracing” effect—ie, lots of levels. 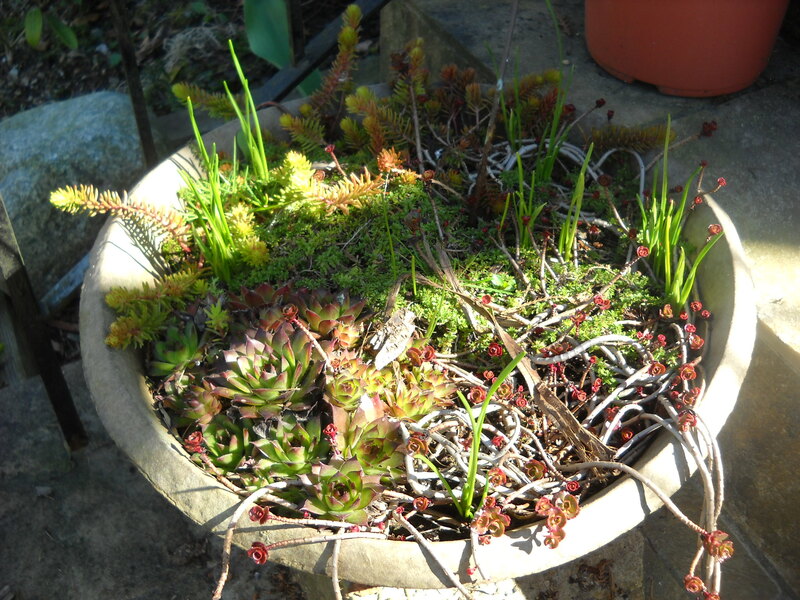 This is a small pot that just barely fits on a front step: a bunch of different sedums, some creeping thyme for summer flowers, and mini-daffodils that are just beginning to bud out. Bigger is better. 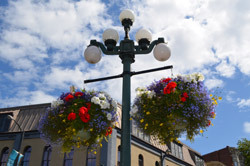 Have you noticed the size of Victoria’s hanging baskets, or New West’s? They’re enormous. And therefore are able to hold onto more water. 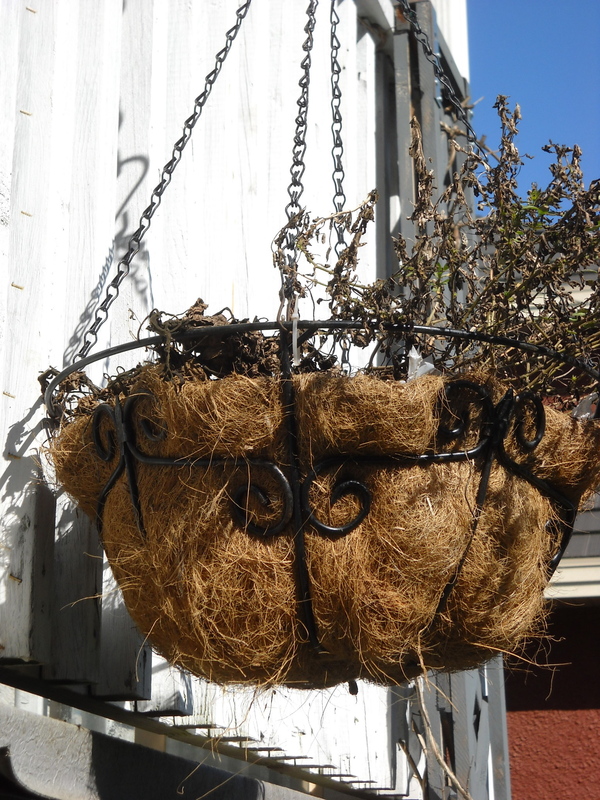 The most important thing about hanging baskets is water, because they’re completely open to evaporation. Many garden centres recommend moisture crystals, but my favourite expert on everything horticultural, Linda Chalker-Scott from Washington State U says they’re pointless (or worse). Buy potting mixture for hanging baskets. In fact, always buy potting mixture for containers rather than something that’s called topsoil, or compost, or anything that is “soil based”. Real soil is way too heavy for containers of any kind, and containers don’t have the advantages of the ground (full of microbes and worms to do all the real work of growing plants). 6. 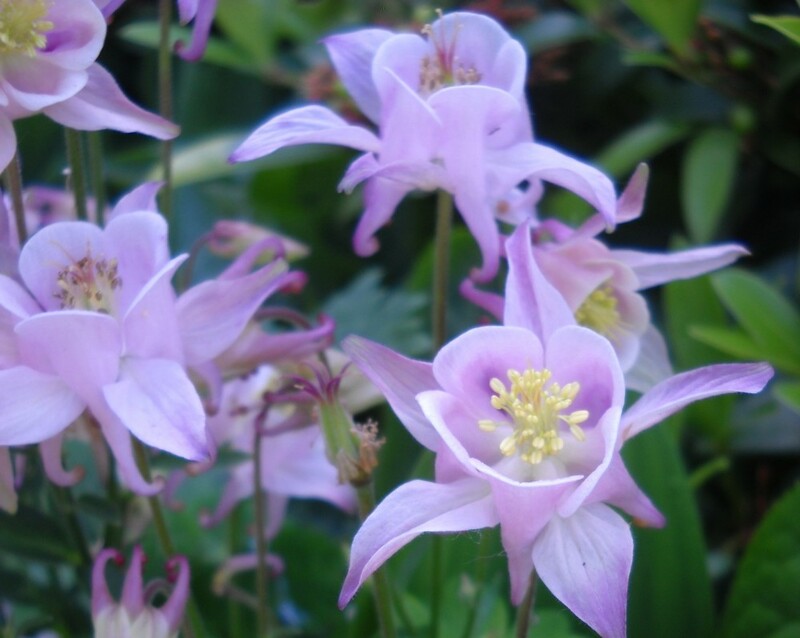 One of my favourite links for growing things in our location: Great Plant Picks for maritime northwest garden. 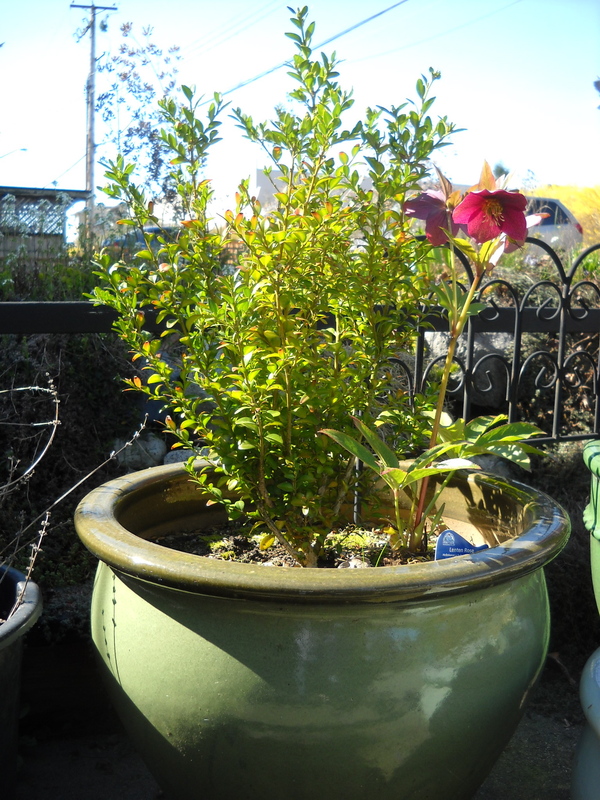 Do you need help figuring out your container garden(s)? Just ask. You won’t be my test garden. Or leave a comment. I’ve been digging. I don’t really like digging, unless it’s just digging into the soil in order to put something into a hole and then fill it again. Today (and yesterday and the day before) I was digging up mostly dead sod, shaking it free-ish of soil, and then digging a hole and putting something into it and mostly filling it again. If you’re going to shortcut something, make sure you’re doing it right. 01:12:02 Gus, you made a wrong turn. 01:12:30 How could you possibly expect to drive through this? 01:12:33 I never had no trouble with a horse. 01:12:38 You’d better carry me to shore, and I’ll walk back to the highway. 01:12:42 I think you’d be better off waitin’ right here. 01:12:45 Gus, will you please do as I say? 01:12:57 The other way! Turn around! Huh? 01:13:00 Gus, turn around! Oh! Oh! You probably know about “lasagna gardening”. It’s a system of building an organic space by layering material over what’s already there. You save the “structure” of the soil, prevent new weeds from springing up because they stay smothered and light-free, and the worms love it enough to chomp through all the layers giving a rich plantable bed in a few months’ time. The key is LOTS OF LAYERS. I did NOT do lots of layers, mainly because I didn’t have ready access to lots of layers. The layers would be leaves, straw, compost, and starting it all off, cardboard. I had the cardboard–went to The Edmonds Appliance warehouse and got quantities of giant refrigerator boxes. But that was only after I’d already started with some very light weight boxes, so light weight that they began to disintegrate before what was underneath them– ratty grass and buttercup–had died off. 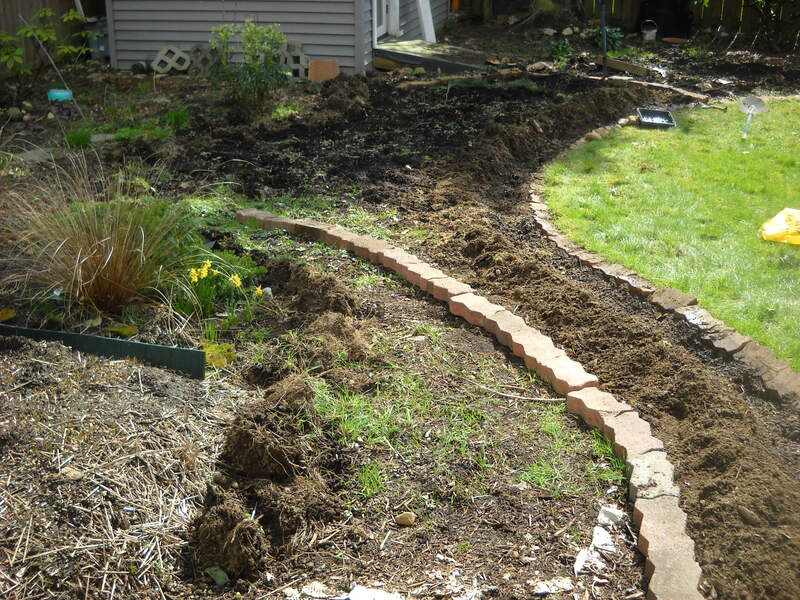 But never mind, I still had layers– 3 metric tons of hand shovelled compost to be exact. But compost, even at the end of the season when it’s been pretty dry and the compost is relatively unsaturated, is heavy, and 3 metric tons of it doesn’t go as far as you want it to go. And then other layers? Leaves are hard to come by on a street that’s 100% conifer-treed. Went down to BSS where the boulevard is full of maples and harvested about ten giant bags, but once those were shredded, there was only enough to mulch the important bits, not enough to layer the lasagna bed. You’ve had enough of the sordid story. 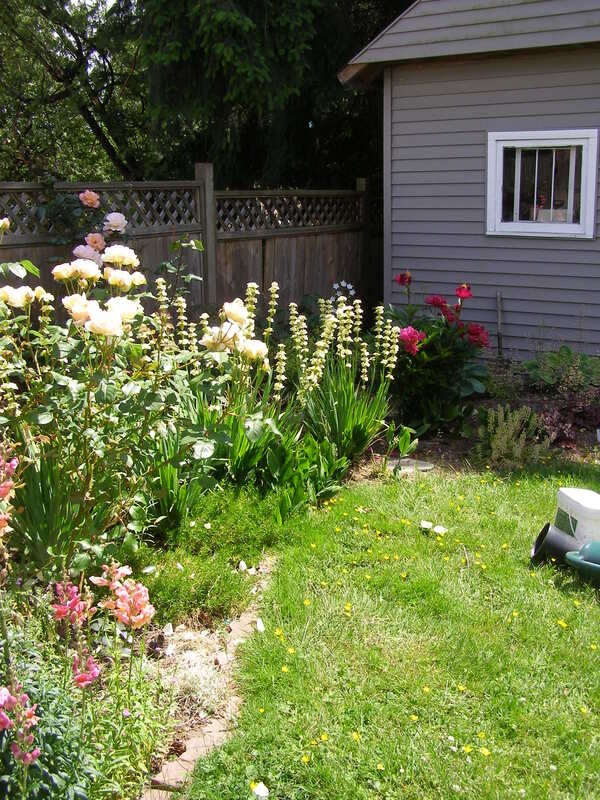 The end result is that if I hope to plant into this bed this year, I have to dig out the not-nearly-composted, mostly-dead turf/buttercup. Plan out your garden before you do anything that will require a lot of undoing! Here’s the bed a few years ago, when I’d dug out quantities of turf to make what I thought was a perfect sized bed. Before, there were stepping stones, but not enough room around them to escape the giant rose (“Jude the Obscure”), the various peonies that take up a lot more space when they’re 5 years old than they did when there were infants, and everything else that’s growing in girth. I guess that’s why it’s good to know the mature size of plants in order to PLAN. There was no path leading to anything in the garden, so it looked full, but kind of…pointless. Like getting in the car to go somewhere, but you don’t quite know where to go. So last fall, 5-1/2 years into my tenure here, I tried to design a pathway through to back beds, knowing that I’d have to undo an awful lot of what’s been done before. Oh well, gardening is always a work in progress. So I would save you from my mistakes: hire me to help you plan!! If you have a similar story leave me a comment. This isn’t clover of course, but it is a happy bee. I’m sure you enjoyed reading my last post about legumes and nodules and nitrogen fixing. Well this post is Part B: the benefits of clover in your lawn. So that’s the first benefit–rich soil. The second benefit (and I’m sure there are a lot more, but I only know of these two) is that white clover is much more drought tolerant than grass. Which, face it, is a very thirsty plant (hungry and thirsty), needing at least 1″ of water once or twice a week. Or you can do as I do, let it go dormant in the summer drought months–usually late July to early September here in Metro Vancouver–and tolerate a brown lawn. Or you can sow white clover, and have a green lawn all summer long with little or no added water. Clover flowers are very tasty to bees or all sorts, (another benefit! 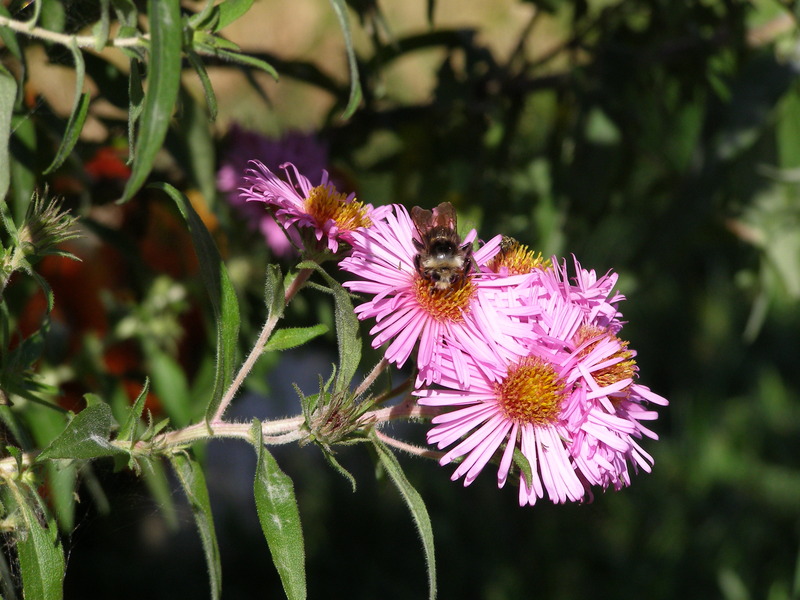 ), so if you’re allergic to bee stings, I highly recommend mowing your lawn whenever there are flowers. And your clover plants will die out after two or three years, so you’ll need to overseed from time to time. But you may already be overseeding every fall anyway, so just make sure you’ve got some Trifolium repens in the mix. That preface didn’t at all prepare us for the amazing and hilarious hour that was to come. Chemical talking between species is unbelievable! For example, did you know that there is a mucousy phase around all the root hairs of a plant the the plant secretes itself. And into that phase the root hairs leak specific sugars and amino acids that attract beneficial organisms which then take up all the available space making it inhospitable to pathogens. Here’s another tidbit. We all know that clover is a legume, and legumes are Nitrogen fixing plants, right? Wrong. It’s the bacteria that the clover attracts that does the N-fixing. The clover secretes flavonoids which are “come hither” chemicals that attract the N-fixing bacteria. The bacteria then coat themselves in a friendly sugar that the clover recognizes as something it needs, and invites them in. The bacteria literally invade the roots of the clover and the clover is so happy about it that it forms a protective covering around the rapidly growing colony of bacteria. Those are the nodules you see at the end of roots when you pull up a legume plant.